Ex vivo recognition of yeast particles and live fungi by inflammatory cells. A) Representative flow-cytometric analysis, gated on Ly-6G+ neutrophils, after coincubation of BIOgel-elicited inflammatory cells from wild type or dectin-1-deficient (Clec7a−/−) 129S6/SvEv interaction with serum-opsonized or non-opsonized zymosan. Positive staining for the A405-labelled zymosan identifies the neutrophils that are associated zymosan and only these cells exhibit conversion of APF, the ROS reporter. B) Representsative flow-cytometric analysis of CD11b and dectin-1 expression by inflammatory neutrophils and monocyte/Mø. Data represents specific receptor staining (shaded histograms) and isotype control staining (bold lines). Data representative of 2 independent experiments and consistent with previous experiments with thioglycollate. C) Inflammatory cells were loaded with APF and then incubated with serum-opsonized or non-opsonized A405-labelled zymosan or Pacific Orange-labelled C. albicans for 15 minutes. After this time the association of the inflammatory cells with zymosan was measured by flow-cytometry (upper panels) and in those cells that were interacting with zymosan the evidence for fluorescent conversion of APF was also quantified (lower panels). Data is derived from three independent experiments and the data derived from the use of dectin-1-deficient cells is shown relative to wild type cells (100%) as mean±95% confidence interval (raw representative data from one of the 3 independent experiments are shown in the Figure S1). The impact of complement osponization (‘C’) and the use of different fungal particle used (‘F’) were assessed by Two-way ANOVA (‘I’ = Interaction statistic). Samples in which the 95% confidence intervals do not overlap with the mean wildtype are specific indicated with a # symbol. Differences in impairment of response observed with dectin-1-deficient cells were further analysed by Bonferroni post-tests. P values derived from individual Bonferroni post-tests are indicated with bracketed pairs of samples. Rat anti Mouse dectin-1 antibody, clone 2A11 (MCA2289) used for the evaluation of dectin-1 expression on wild type and knockout mouse macrophages by flow cytometry. Dectin-1 response and expression is Ae2-dependent. (A and B) Tnfα mRNA expression relative to Hprt in Ae2wt/wt and Ae2Δ/Δ macrophages stimulated for 6h with Zymosan (5 ppc) (A) or PAM3CK4 (B) (n = 8–10, ** p<0.01, Mann-Whitney test). 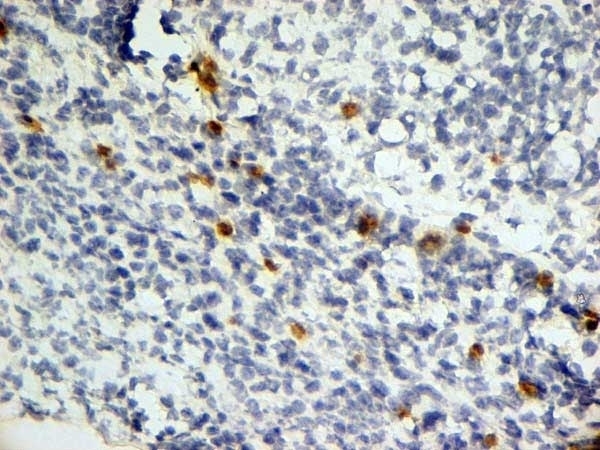 (C) Ae2 mRNA expression relative to Hprt by WT macrophages stimulated for 6h with Zymosan (Zym, 5 ppc) or PAM3CK4 (100 ng/ml) (n = 8–12, * p<0.05, *** p<0.001, Mann-Whitney test). 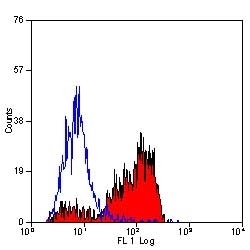 (D) Representative flow cytometry histogram with quantification by mean fluorescence intensity (MFI) of Dectin-1 expression on cell surface of Ae2wt/wt and Ae2Δ/Δ macrophages (n = 8, *** p<0.001, Mann-Whitney test). (E) Representative flow cytometry histogram and MFI of CD64 expression on cell surface of Ae2wt/wt and Ae2Δ/Δ macrophages (n = 5). Anion Exchanger 2 Regulates Dectin-1-Dependent Phagocytosis and Killing of Candida albicans. Rat anti Mouse dectin-1 antibody, clone 2A11 (MCA2289) used for the evaluation of dectin-1 expression on wild type and treated mouse macrophages by flow cytometry. Pharmacological alkalinization of pHi inhibits Dectin-1 expression. (A) Dectin-1 expression relative to Hprt by wild-type macrophages treated with bafilomycin A (Baf A, 25 nM) or DMSO control for 6 and 16 h. (B) Representative flow cytometry histogram and (C) quantification by MFI showing decreased Dectin-1 in wild-type macrophages treated with Baf A for 6 and 16 h compared to DMSO control (n = 6, ** p<0.01, Mann-Whitney test). 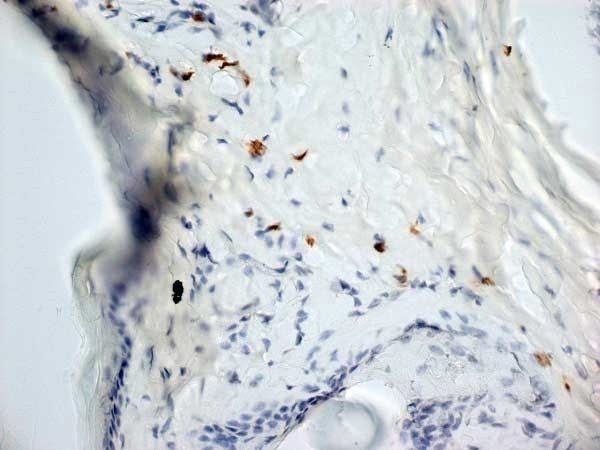 Rat anti Mouse Dectin-1 antibody, clone 2A11 (MCA2289) used for the evaluation of surface dectin-1 expression by murine peritoneal and bone marrow derived macrophages by flow cytometry. Murine primary macrophages including peritoneal macrophages and BMDM express similar levels of the BG receptor dectin-1 and exhibit the same ability to respond to Sc BG extracts. (A-B) Freshly isolated 4-days thioglycollate-elicited peritoneal macrophages (TEPM), resident peritoneal macrophages (RPM) and BMDM from WT and Clec7a-/- C57Bl/6, and DBA/2 mice, and the macrophages cell line RAW-Blue™, used as control, were assessed for surface expression of dectin-1 by flow cytometry (MACSQuant®, Miltenyi Biotech, Germany). 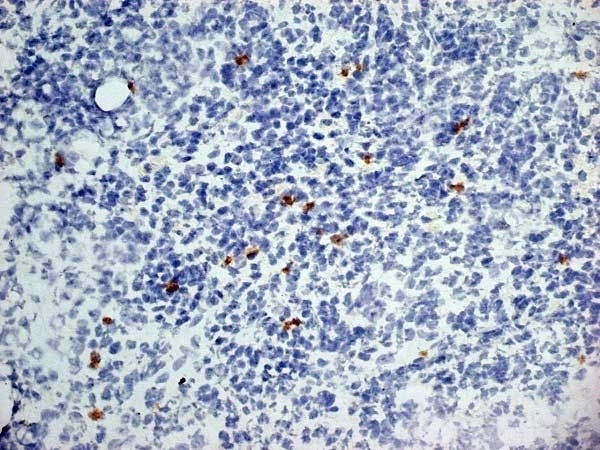 Doublets of cells were excluded at the beginning of the acquisition and a 7-AAD staining was used to discriminate death cells. The surface expression of dectin-1 was determined for each type of primary macrophages on CD115+ cells. (A) Data are expressed as the frequency of dectin-1+ among CD115+ cells. (B) The mean of fluorescence intensity (MFI) of dectin-1 was established on CD115+ cells. Results are presented as the mean ± SD MFI of dectin-1 corrected by either the MFI of isotype control for RAW macrophages, or the MFI of Clec7a-/- C57Bl/6 for WT C57Bl/6 or DBA/2 primary macrophages. (C) Remaining TEPM and BMDM from WT and Clec7a-/- C57Bl/6 mice isolated from these experiments were subcultured and stimulated with 100 μg/mL of crude or enriched Sc BG CW extracts (BG15, BG65 or BG75) or zymosan for 8 h (37°C, 5% CO2). Supernatants were collected immediately after incubation and were assessed for TNFα production by ELISA. Results are shown as the mean ± SD. All data are representative of three mice per group from three independent experiments performed in triplicate. *p <0.05 (two-tailed unpaired Student's t-test); mean values not sharing the same letter are significantly different. 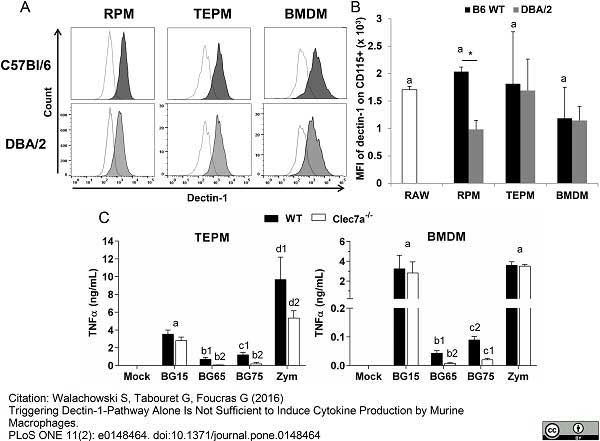 From: Walachowski S, Tabouret G, Foucras G (2016) Triggering Dectin-1-Pathway Alone Is Not Sufficient to Induce Cytokine Production by Murine Macrophages. PLoS ONE 11(2): e0148464. Rat anti Mouse Dectin-1 antibody, clone 2A11 recognizes murine beta-glucan receptor, also known as Dectin-1.Dectin-1 is predominantly expressed by cells of the monocyte/macrophage and neutrophil lineages, but also at lower levels by dendritic cells and a subpopulation of T cells. As a major leucocyte receptor for beta-glucan this molecule may have a key role in the immunomodulatory effects of beta-glucans and in the host response to fungal pathogens. Dectin-1 may stimulate reactive oxygen production in macropahges via the protein tyrosine kinase known as Syk. Rat anti Mouse Dectin-1 antibody, clone 2A11 inhibits the binding of zymosan to macrophages via the beta-glucan receptor. Dectin-1 transfected NIH3T3 cells and recombinant soluble Dectin-1. 1The epitope recognised by 2A11 is sensitive to H202 treatment, therefore quenching with 0.3% H202 should be performed after incubation with the primary antibody. 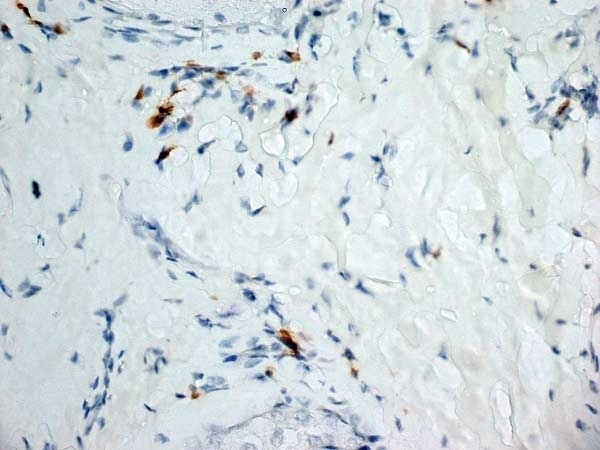 The epitope recognised by this antibody is reported to be sensitive to formaldehyde fixation and tissue processing. Bio-Rad recommends the use of acetone fixation for frozen sections. Brown, G.D. et al. (2002) Dectin-1 is a major beta-glucan receptor on macrophages. J Exp Med. 196 (3): 407-12. Taylor, P.R. et al. (2002) The beta-glucan receptor, dectin-1, is predominantly expressed on the surface of cells of the monocyte/macrophage and neutrophil lineages. J Immunol. 169 (7): 3876-82. J Leukoc Biol. 76 (1): 86-94. Underhill, D.M. et al. (2005) Dectin-1 activates Syk tyrosine kinase in a dynamic subset of macrophages for reactive oxygen production. Fei, M. et al. 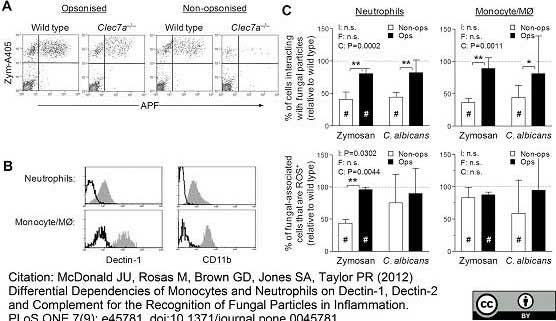 (2011) TNF-alpha from inflammatory dendritic cells (DCs) regulates lung IL-17A/IL-5 levels and neutrophilia versus eosinophilia during persistent fungal infection. Proc Natl Acad Sci U S A. 108 (13): 5360-5. Gazi, U. et al. (2011) Fungal Recognition Enhances Mannose Receptor Shedding through Dectin-1 Engagement. J Biol Chem. 286: 7822-9. Dewals, B.G. et al. (2010) IL-4Ralpha-independent expression of mannose receptor and Ym1 by macrophages depends on their IL-10 responsiveness. PLoS Negl Trop Dis. 4: e689. Galès, A. et al. 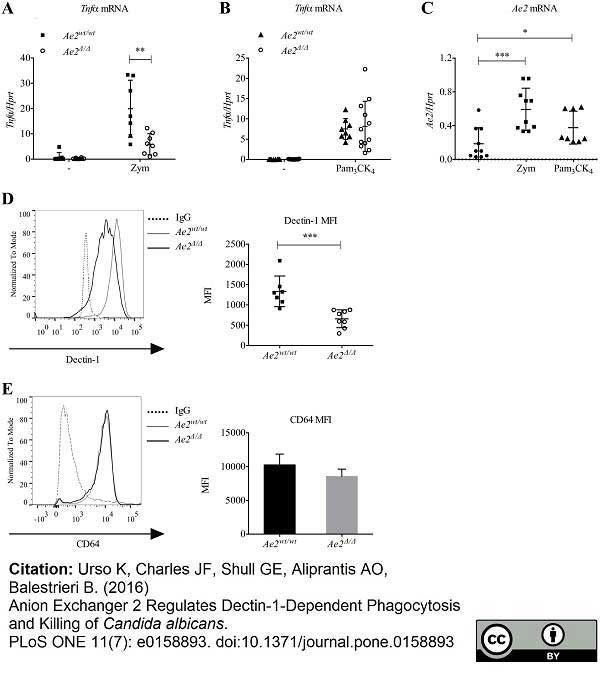 (2010) PPARgamma controls dectin-1 expression required for host antifungal defense against Candida albicans. Coates, P.J. et al. (2008) Indirect macrophage responses to ionizing radiation: implications for genotype-dependent bystander signaling. Dioszeghy, V. et al. (2008) 12/15-Lipoxygenase regulates the inflammatory response to bacterial products in vivo. Hohl, T.M. (2008) Caspofungin modulates inflammatory responses to Aspergillus fumigatus through stage-specific effects on fungal beta-glucan exposure. J Infect Dis. 198: 176-85. Palma, A.S. et al. (2006) Ligands for the beta-glucan receptor, Dectin-1, assigned using "designer" microarrays of oligosaccharide probes (neoglycolipids) generated from glucan polysaccharides. J Biol Chem. 281: 5771-9. Sindrilaru, A. et al. (2011) An unrestrained proinflammatory M1 macrophage population induced by iron impairs wound healing in humans and mice. J Clin Invest. 121: 985-97. Anandasabapathy, N. et al. (2011) Flt3L controls the development of radiosensitive dendritic cells in the meninges and choroid plexus of the steady-state mouse brain. J Exp Med. 208 (8): 1695-705. Takahara, K. et al. (2012) Efficient capture of Candida albicans and zymosan by SIGNR1 augments TLR2-dependent TNF-α production. Int Immunol. 24 (2): 89-96. Fransen F et al. (2015) BALB/c and C57BL/6 Mice Differ in Polyreactive IgA Abundance, which Impacts the Generation of Antigen-Specific IgA and Microbiota Diversity. Urso, K. et al. 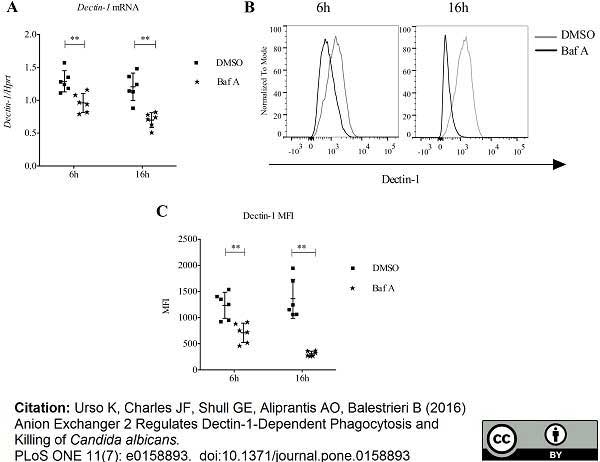 (2016) Anion Exchanger 2 Regulates Dectin-1-Dependent Phagocytosis and Killing of Candida albicans. PLoS One. 11 (7): e0158893. Zhou, J. et al. (2016) Therapeutic targeting of myeloid-derived suppressor cells involves a novel mechanism mediated by clusterin. Pinke, K.H. et al. (2016) Mast cells phagocyte Candida albicans and produce nitric oxide by mechanisms involving TLR2 and Dectin-1. Bioactive Carbohydrates and Dietary Fibre. 6 (1): 15-23. Walachowski, S. et al. (2016) Triggering Dectin-1-Pathway Alone Is Not Sufficient to Induce Cytokine Production by Murine Macrophages. PLoS One. 11 (2): e0148464. Ferguson, B.J. et al. (2015) The Schistosoma mansoni T2 ribonuclease omega-1 modulates inflammasome-dependent IL-1β secretion in macrophages. Int J Parasitol. 45 (13): 809-13. Masuda, Y. et al. (2015) Soluble β-glucan from Grifola frondosa induces tumor regression in synergy with TLR9 agonist via dendritic cell-mediated immunity. J Leukoc Biol. 98 (6): 1015-25. Baldwin, K.T. et al. (2015) Neuroinflammation triggered by β-glucan/dectin-1 signaling enables CNS axon regeneration. Proc Natl Acad Sci U S A. 112 (8): 2581-6. Quayle K et al. (2015) The TLR2 agonist in polysaccharide-K is a structurally distinct lipid which acts synergistically with the protein-bound β-glucan. J Nat Med. 69 (2): 198-208. Chang, T.H. et al. (2017) Dectin-2 is a primary receptor for NLRP3 inflammasome activation in dendritic cell response to Histoplasma capsulatum. PLoS Pathog. 13 (7): e1006485. Seo, B.S. et al. (2016) Dectin-1 agonist selectively induces IgG1 class switching by LPS-activated mouse B cells.